Except as specified herein, this policy also does not apply to information you may provide to us offline; however please do be aware that if you subscribe offline to one of the magazines published by HSM (“Magazines”), from time to time we make your postal addresses available to companies for marketing purposes. Information You Provide. HSM generally collects Personally Identifiable Information that you voluntarily provide. For instance, when you enter a sweepstakes or contest, complete a survey, participate in a reader panel, register for those portions of our Covered Sites that may require registration, make a purchase, participate in our social networking features, request back issues of our Magazines, subscribe to our Magazines, subscribe to receive newsletters, promotional correspondence, or other electronic services, or send us an email or feedback, you may be asked to provide information such as your e-mail address, name, phone number, shipping address, and billing information, and we will collect such information as well as any other content you provide us in engaging in any of the above activities. Information such as your age, gender, hobbies or interests may also be requested. If you elect to post material to any blogs, forums, participate in our social networking features or other community boards that may be offered on our Covered Sites, then such materials will be collected and may be publicly available for others to view. HSM uses information we collect from you in part to provide you with the service you have requested. If you subscribe to any of our Magazines, we may also use your e-mail address to send you a confirmation notice and your mailing address to send you your Magazine. Similarly, if you enter online sweepstakes, we will also use this information to notify you if you are a winner. We also use your information to register you, identify you as a user, improve our Covered Sites and services, send you administrative notifications, and respond to your inquiries. We might also send out e-mails to users and sweepstakes/contest entrants to announce special offers, services and announcements from our Covered Sites, our partners and/or our advertisers. We also use information in connection with advertising and to serve other content, as described in section 4(d) below. When you provide us your email address (e.g., to subscribe to our Magazines) but are not already a registered user of one of our Covered Sites, some of our Covered Sites may assign you a user name and password so that we can enhance your user experience by facilitating easy entry into other features and offers on the Covered Sites and saving your preferences. Certain areas on our Covered Sites require registration, and in those areas, you will be asked to establish your own user name and password or you can elect to use the one we’ve assigned. Your user name and password (“User Registration”) will function across many of our Covered Sites, regardless of brand. Your User Registration will also be recognized at some of our Affiliate sites and sites which we partner with so that you may easily access features on those sites using your User Registration (“Shared Registration Sites”); however the information we provide and your actions on those Shared Registration Sites will be governed by the separate privacy policies of those Shared Registration Sites. A list of those Shared Registration Sites is set forth below, and may be updated from time to time. Current Shared Registration Sites are: The National Magazine Company Limited. You may elect to change your User Registration at any time by logging in and editing your User Registration (each of our Covered Sites will contain log-in information). You may also log-in to cancel any user User Registration that you may have selected or that we may have assigned. If you cancel your User Registration, we will retain your email address, user name and assigned user ID on file and use them only for the purpose of assuring you are not automatically registered again, against your wishes. You may request deletion of your Personally Identifiable Information by us, but please note that we may be required to keep this information and not delete it (or to keep this information for a certain time, in which case we will comply with your deletion request only after we have fulfilled such requirements). When we delete any information, it will be deleted from the active database, but may remain in our archives. We may retain your information for fraud or similar purposes. In addition, we may use information you provide us through emails, Q&A, blogs, forums, in response to polls, or through any other user generated submission for editorial purposes, and may use your name and any stories you provide us in articles published online and in our Magazines. If you provide us with personal anecdotes, they may be attributed to you. HSM can edit, rewrite, use, and reuse the content, including your name, likeness, photograph, and biographical information you provide, with or without attribution, including publication in the Magazines, and in trade media, and advertising. We utilize third party service providers to provide products, services or functions on our behalf (such as sending emails or processing credit cards or fulfilling subscriptions), and ask these service providers to agree to maintain the confidentiality of your Personally Identifiable Information and not to use your Personally Identifiable Information for any reason except to carry out the purpose(s) for which we hired them (“Service Provider Exception”). The entity to whom the information is disclosed is an Affiliate of HSM. In addition to ads and content that we serve you directly, we use third-party advertising companies and marketing services companies to serve ads and other content when you visit our Covered Sites and elsewhere on the internet and in other media. Both we and these companies may use information about your visits to this Covered Site and elsewhere to serve ads and other content to you. In the course of doing so, a unique third-party cookie may be placed or recognized on your browser by such companies. In addition, we and these companies may use Web beacons to help manage our online advertising and content. These Web beacons enable us and the third-party companies to recognize a browser’s cookie when a browser visits this site and to learn which banner ads bring users to our website and to serve you ads that you may find of interest elsewhere on the internet and in other media. Both HSM and these companies may use information obtained from your visits to the Covered Sites (including your status as a customer of HSM), other websites, and information received from you offline in order to provide advertisements about goods and services and other content of interest to you across the internet and in other media. If you would like more information about this practice and to know your choices about not having this information used in this manner by our third party advertising companies please visit http://www.networkadvertising.org/optout_nonppii.asp . You may also visit alc-opt-out.com to find out how our marketing services companies operate. Ads in our videos may be served by an ad partner. California & Canadian Users: Your California Privacy Rights.California’s “Shine the Light” law, Civil Code section 1798.83, requires certain businesses to respond to requests from California customers asking about the businesses’ practices related to disclosing personal information to third parties for the third parties’ direct marketing purposes. Alternatively, such businesses may have in place a policy not to disclose personal information of customers to third parties for the third parties’ direct marketing purposes if the customer has exercised an option to opt-out of such information sharing. We have such a policy in place. Sections 4(d) and 5(d) explain our practices and how you can opt-out of having your information shared with third parties for the third parties’ direct or indirect marketing purposes, in accordance with such laws. In addition to reviewing Sections 4(d) and 5(d), if you wish to find out about any rights you may have under California Civil Code section 1798.83, you may notify us in writing at High School Media, LLC, P. O. 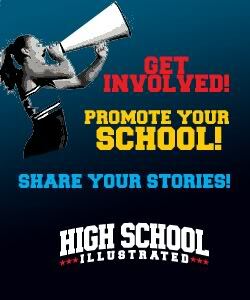 Box 83672, Lincoln, NE 68501 or contacting us at highschoolillustrated@highschoolillustrated.com. Canadian residents also have certain rights to know how their information may be shared with third parties who engage in direct marketing activities. Again, Sections 4(d) and 5(d) explain our practices and how you can opt-out of having your information shared for such purposes, in accordance with such laws. For the avoidance of doubt, these opt-out options are available for all users and are not limited to Californian and Canadian users. Marketing provided by HSM. From time to time we may send you promotional materials on behalf of HSM and/or third parties. If you want us to stop sending you promotional materials to your email, you may follow the unsubscribe instructions in the email or manage your preferences at http://HSM.ed4.net/profile/login.cfm . If you want us to stop sending you promotional materials to your postal mailing address, you may notify us in writing by sending a notice to Mail Preference Service, P.O. Box 6000, Harlan, Iowa 51593 or contacting us at customercare@HSMmags.com . Certain Covered Sites may include a customer service link at the bottom of such site. If so, you may also manage your email preferences through that link. Marketing provided by Third Parties. From time to time we may disclose your contact information to third parties to allow them to market their products or services to you or for other marketing purposes. This may be information we received from you offline and online. If you want us to stop further sharing your postal mailing contact information with third parties (if we have your postal address), you may notify us in writing by sending a notice to High School Media, LLC, P. O. Box 83672, Lincoln, NE 68501 or contacting us at highschoolillustrated@highschoolillustrated.com. If you wish to opt out of having your information shared with marketing services companies, please see section 4(d) abovePlease follow the instructions provided to you by third parties to unsubscribe from their messages. 7. Security of Your Personally Identifiable Information. We use a variety of industry-standard security technologies and procedures to help protect your Personally Identifiable Information from unauthorized access, use, or disclosure. We also require you to enter a password to access your registration information. Please do not disclose your registration password to unauthorized people. No method of transmission over the Internet, or method of electronic storage, is 100% secure, however. Therefore, while HSM uses reasonable efforts to protect your Personally Identifiable Information, HSM cannot guarantee its absolute security. This policy was last updated on November 19, 2013.